Thanks to my great friends and family, and an awesome group of knitters I was able to pull off the best Christmas surprise. I could not write about this on my blog pre-Christmas, on the off-chance that my daughter would actually read my blog. Sofia graduated in May with a Masters in Urban Planning, and immediately started her full-time job working on transportation and housing issues at a not-for-profit, The Center for Neighborhood Technology (CNT). As part of her job, she collects transit data from all over the US and compiles it in relation to housing costs. The previous inhabitant of her cube had dressed it up with a couple of transit maps. Sofia wanted to fill her cubicle with maps from all over the world, but when I saw it last Fall, there were 2. 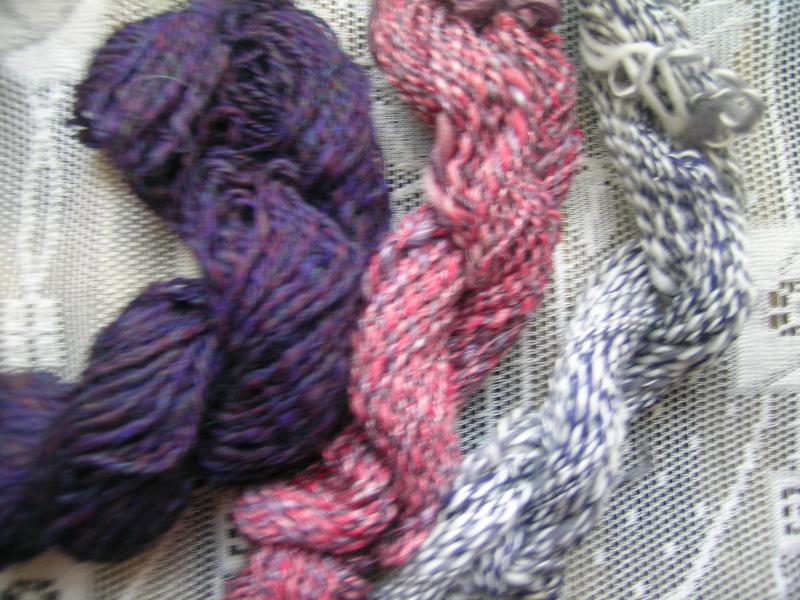 So, I put out the word to friends, family and on Ravelry. I must say that my knitting friends came through in spades. I amassed a collection of maps from all over the US and world. I also purchased a 1953 Chicago transit map, that is pre freeway and still with streetcars, on eBay. 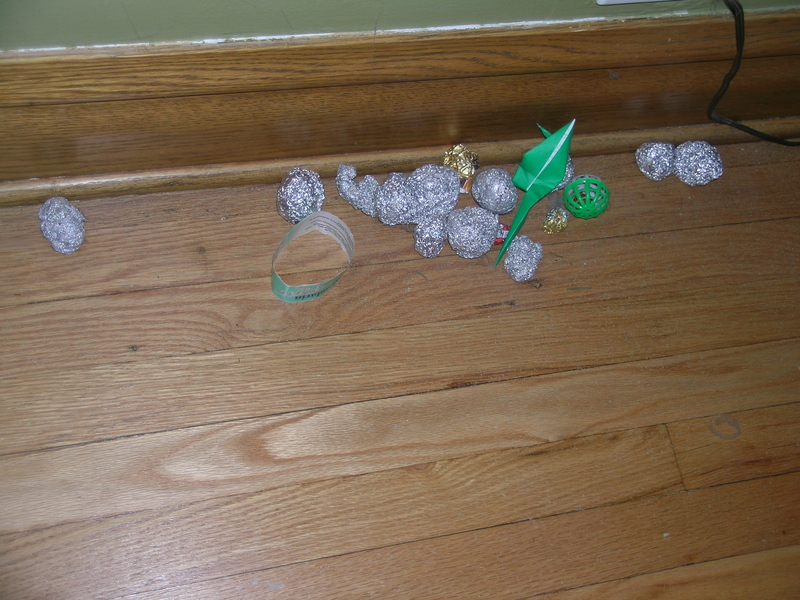 So, I put all these together in layers of 4-5 maps separated by tissue paper in a large shirt box. I almost forgot to give it to her on Christmas morning. I must say that it was a huge hit, and she had so much fun opening it up. I even included all of the notes that people had sent, which were very nice. Word has it that decorating started in the cubicle this week. 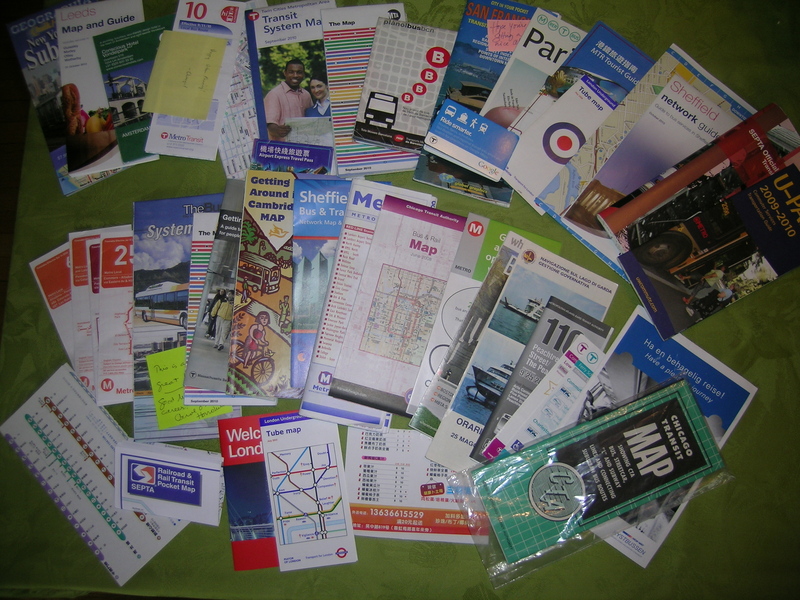 If you have a map you would like to send along, the collection is still growing. Sofia is a self-proclaimed transportation geek. Obvious gaps are China, most of Europe (except London, Paris and Barcelona), in Scandinavia we have Norway only. I really like the writing style of this book, and the easy reference to the sheep breeds. I do not feel like I need a degree in animal husbandry to understand what they are saying, and the information seems to be sticking with me. The photos are all in B&W, but not only does that not deter me from the book, by keeping the color away, it does not influence me in one way or another. I particularly like the fleece lock samples photographed at full size on a black background. 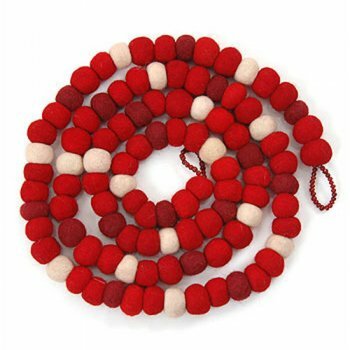 It seems to make the individual properties of the wool stand out even better. And it is a good first reference. 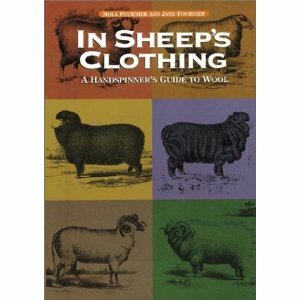 I think I would prefer this as a first sheep fiber book over The Knitters Book of Wool. 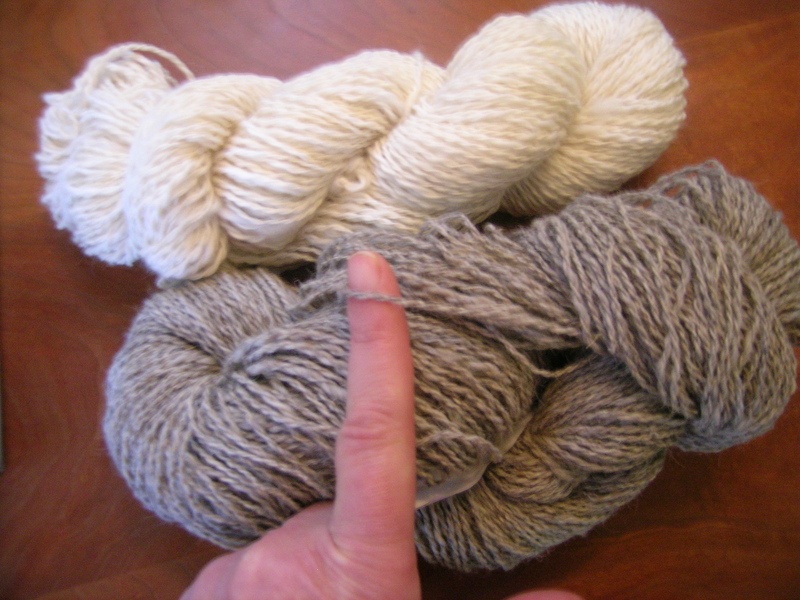 This book is solely about sheep, fiber and its care and preparation, and a bit about spinning. No wasted space with patterns that I would not ever use (that was my main criticism of the aforementioned book). 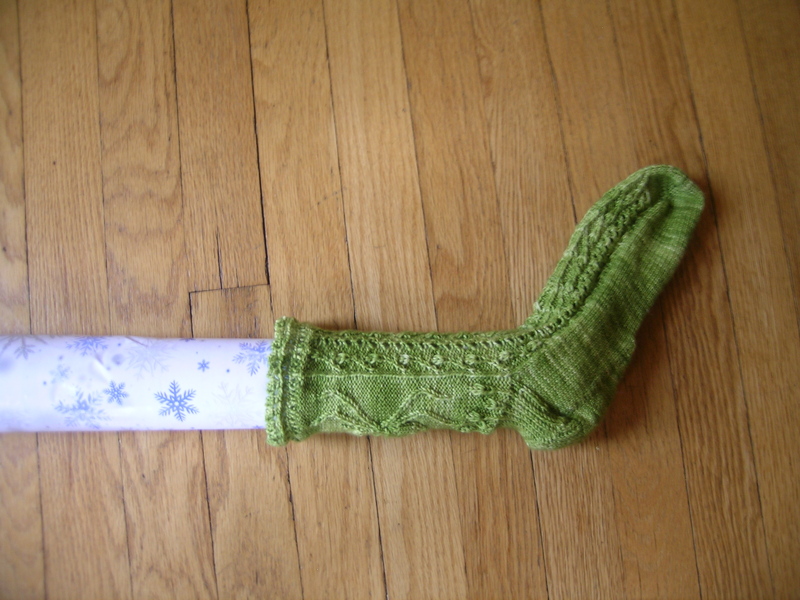 I missed the Holiday gift exchange at the Knitting Guild. My ride fell through, and I didn’t feel like driving by myself at the last-minute. I will definitely plan on attending that next year. I heard that it was a lot of fun. And even undies, with a hole for the tail naturally. 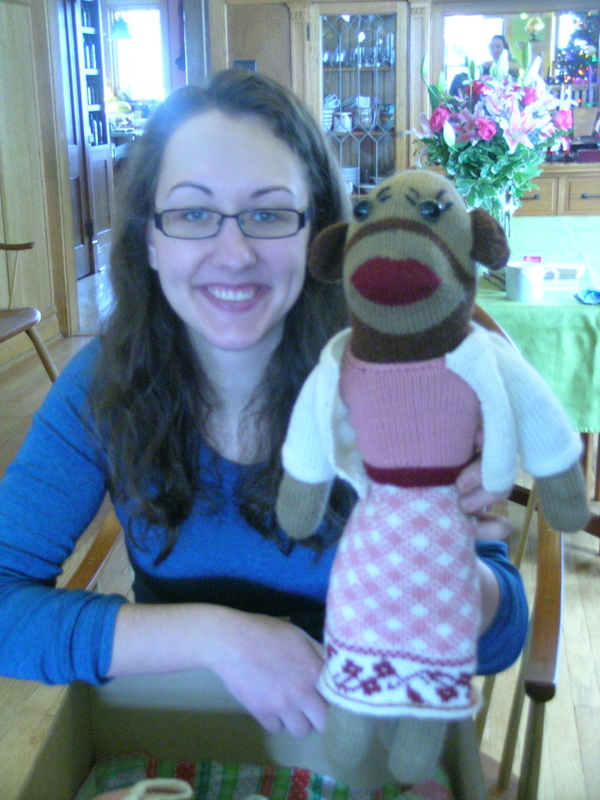 She was a big hit (even though I had left her out, in progress, when Sofia was home over Thanksgiving). 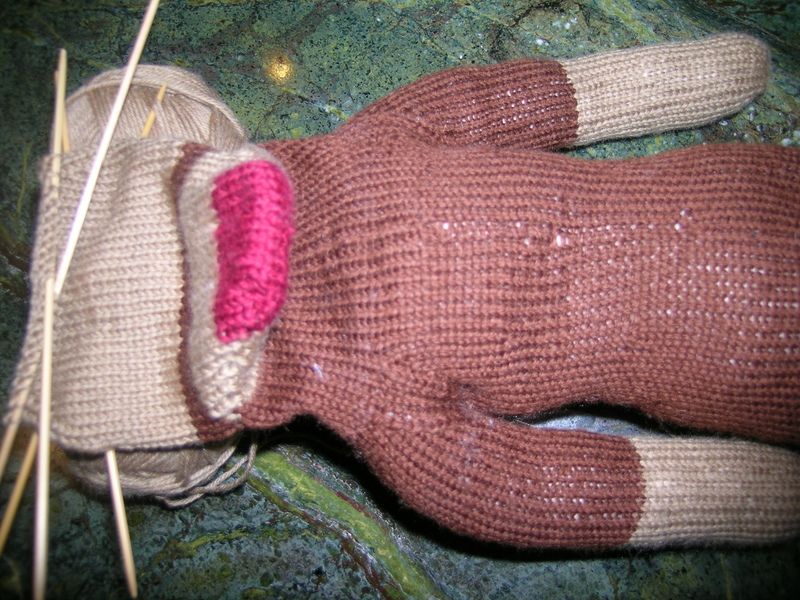 This was a kit from KnitPicks. 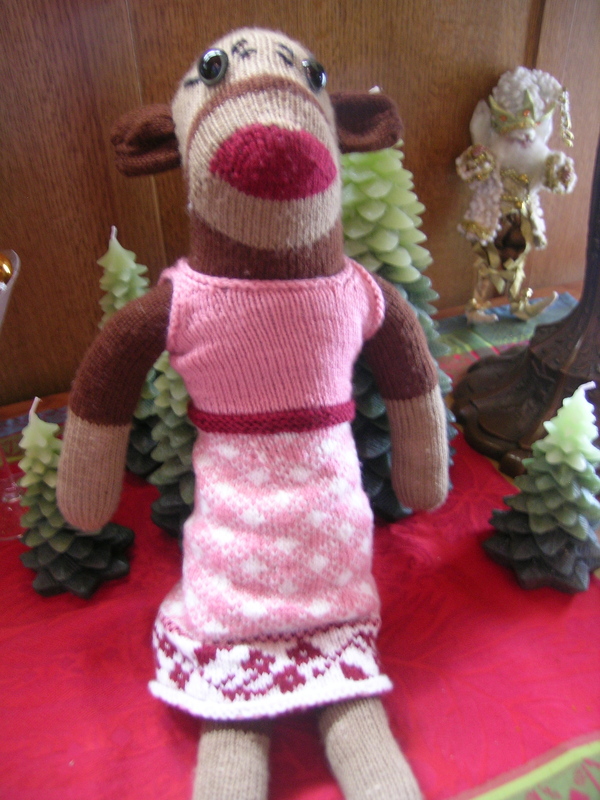 I knit up most of the clothing that was designed for her. 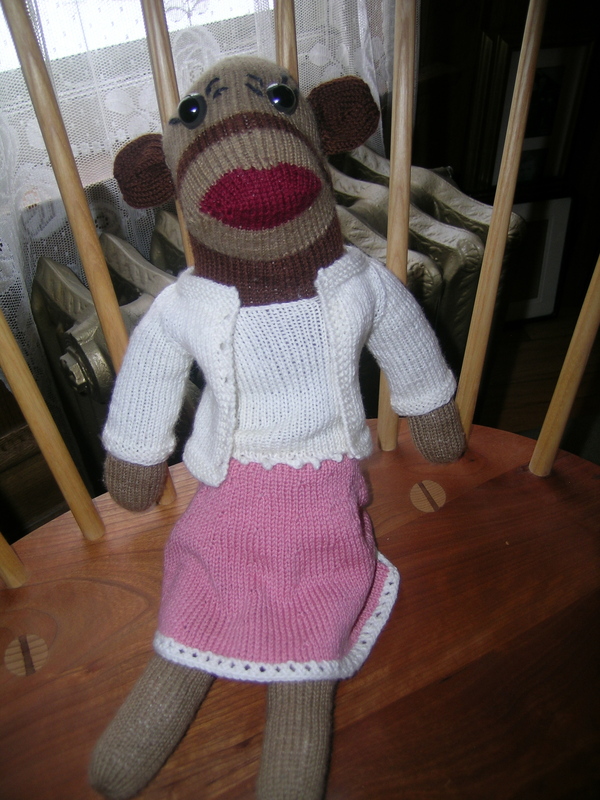 I still have a purse to do, and opted not to make a pair of Capri pants. Sofia has also asked for a beret for her head, and I think perhaps some earrings. 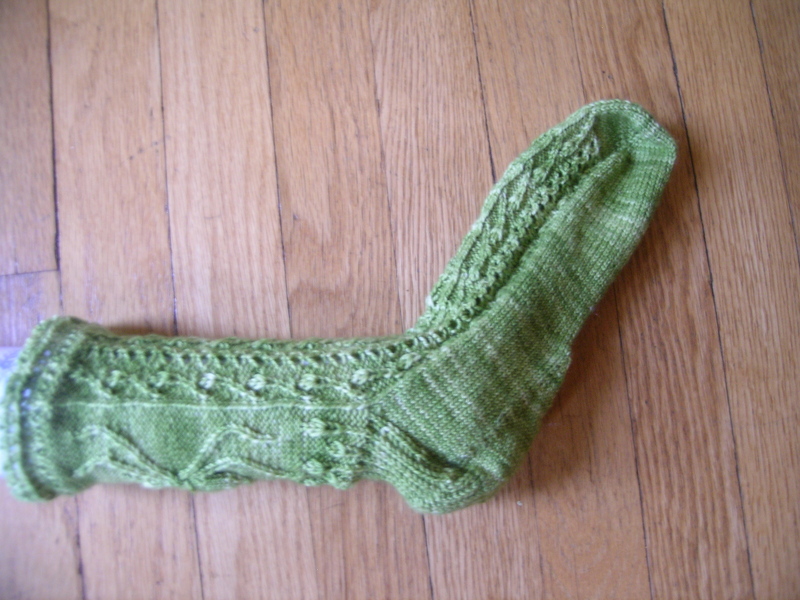 This was knit using the KnitPicks sock yarn, which I was pleasantly surprised with. 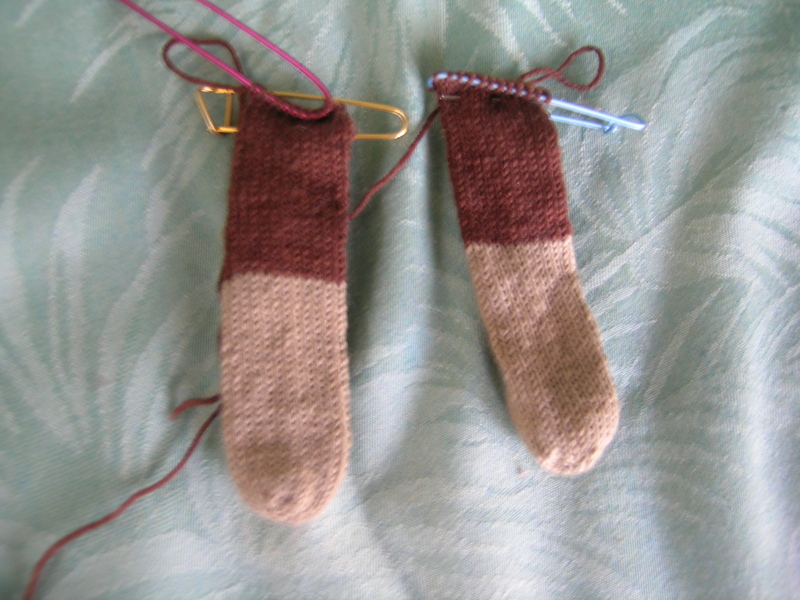 I am not sure that I would make a pair of socks with it, but it knit up nicely. 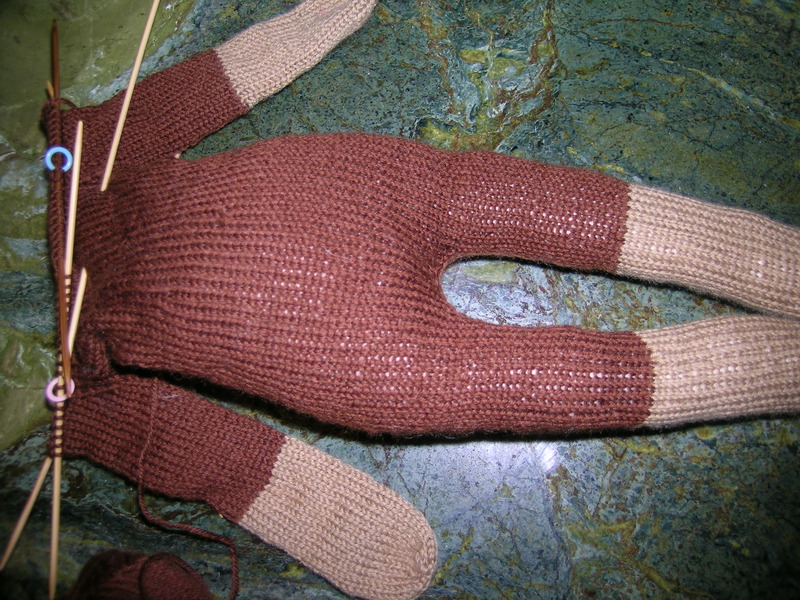 The body of the monkey was knit with size 1 needles, and the clothes were all knit with a size 2 needle. I am really happy that I chose to go up a needle size for the clothes, as I think that they would have been very tight. 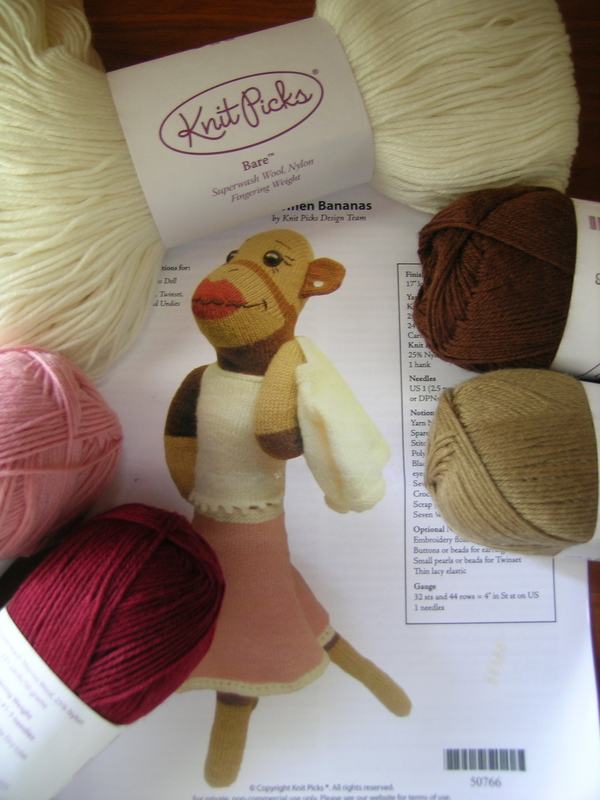 I, fortunately, read a similar comment on Ravelry that cued me into this issue. The body was stuffed with bamboo stuffing. 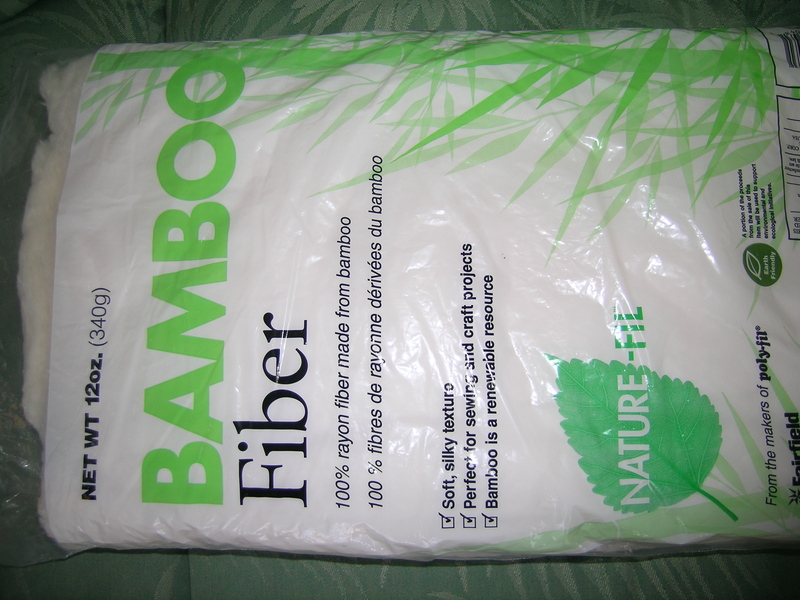 I have never used that before, but thought that it would breathe much better than the polyester. 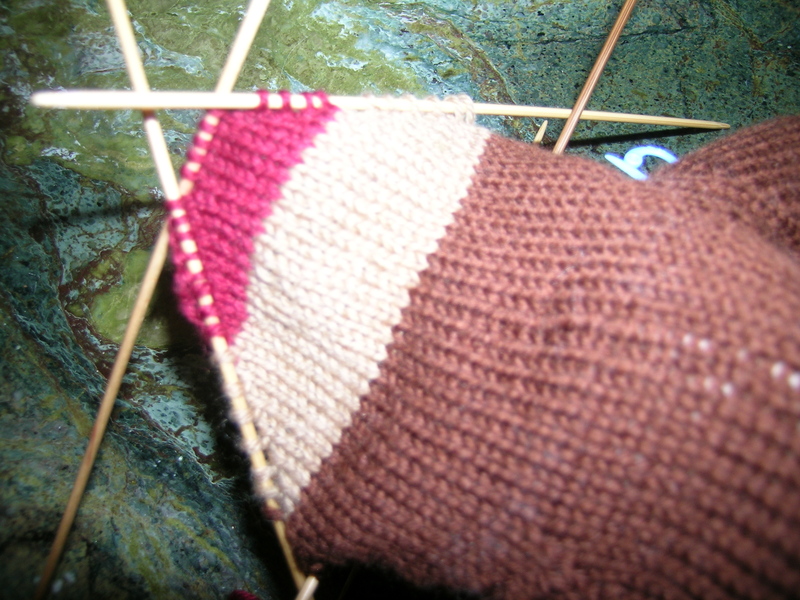 It is a bit dense to run a needle through when sewing up, but I think worth the effort. It has a nice soft firmness to it. She has safety eyes instead of regular buttons, and embroidered eyelashes. 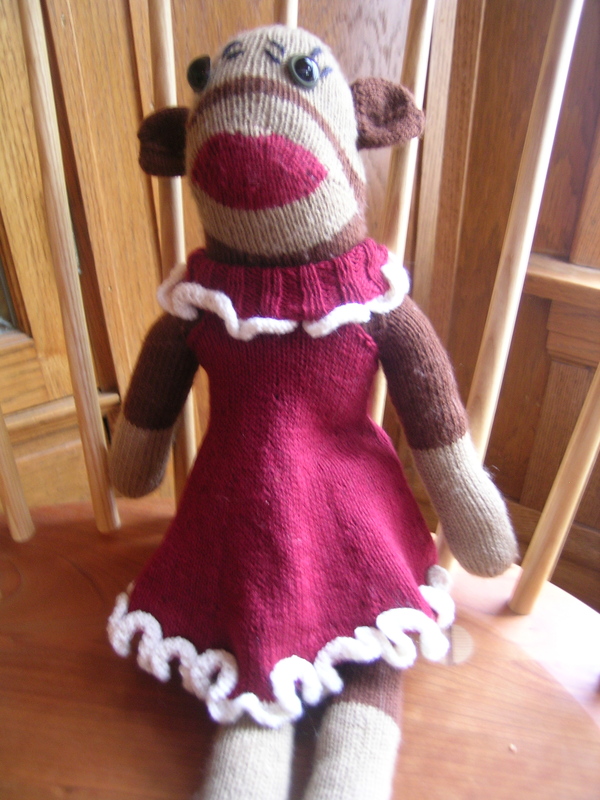 Even duplicate stitch on the lips to give them that feminine flair. 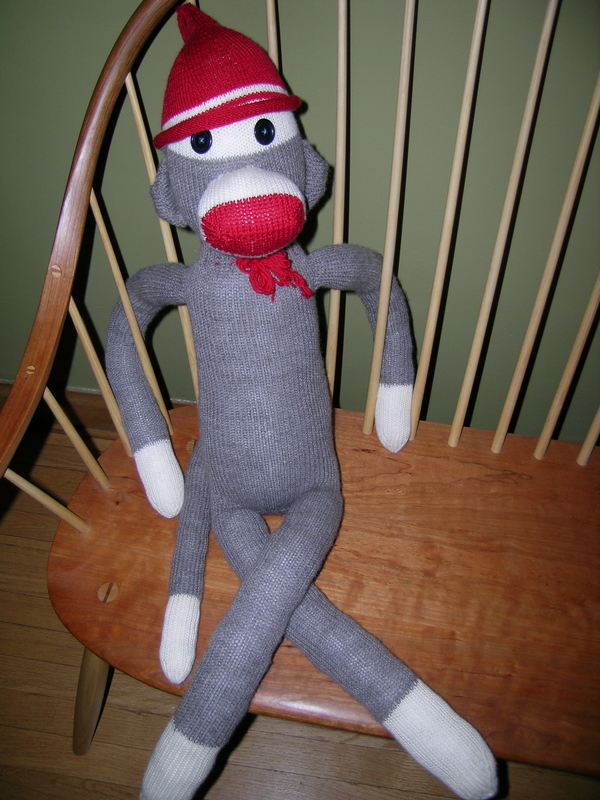 This was made for Sofia, as 3 years earlier I had knit up a VERY large sock monkey for her Christmas present that was a big hit, even though he takes up a lot of space on the bed. And, as Sofia always likes adding a tradition, we started last year with 2 trees. One went up on the front porch at Thanksgiving, and the other in the living room for Christmas. 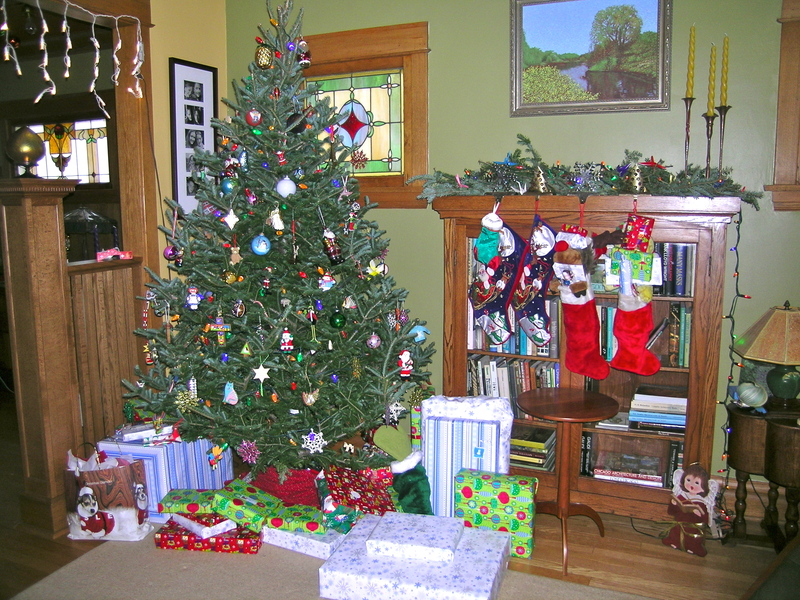 The lights go on early, and the tree waits until both kids are home to decorate. College has meant only 3-4 days before Christmas lately. 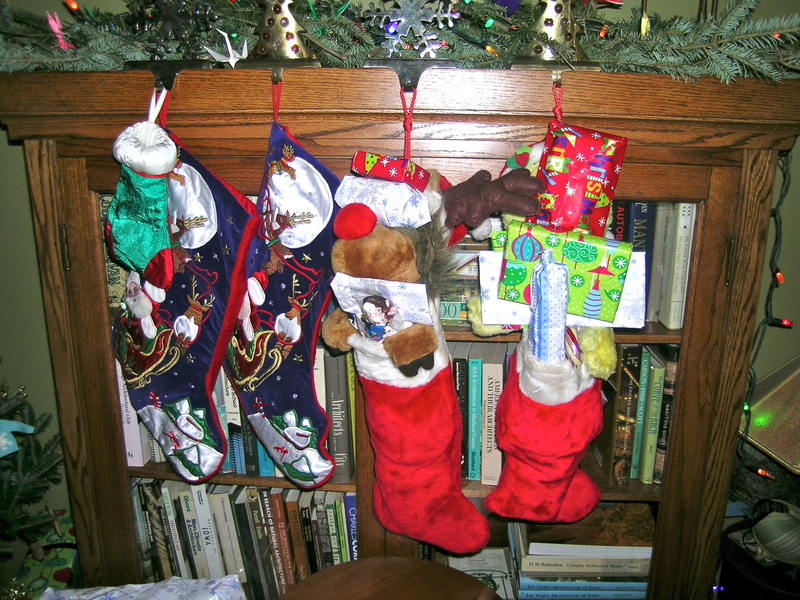 It would not be Christmas without stockings stuffed to the gill at our house, this is my kids favorite part. My sister Diane shares the same affliction. I think that it is growing up in a house with 10 kids, and my mother overwhelmed just to make sure that all the presents for everyone were fair, that stockings were a gold coin and a couple of pieces of candy at the toe. To give her credit, she always made sure that we all had the same number of gifts, and that the same $ were spent on everyone (I saw one of her checklists one year to attest to this). 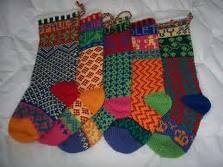 And what is Christmas without a few handknit items? 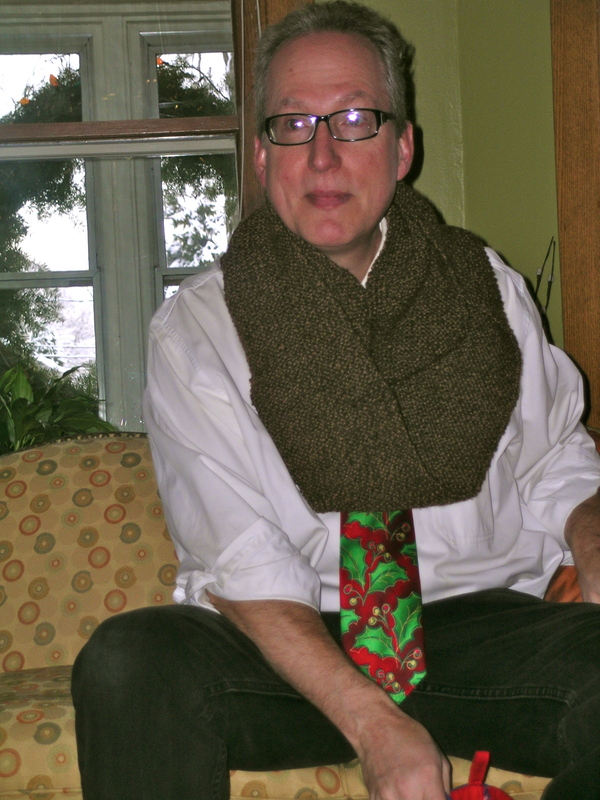 For my husband, a looped scarf from wool that Jill and I got at a sheep farm in California that we visited, dyed with walnuts lining the proprietress’ driveway. He is always complaining of a cold neck when he is working on the computer. I had thought of some type of man-shawl, but did not think that he would really wear it. 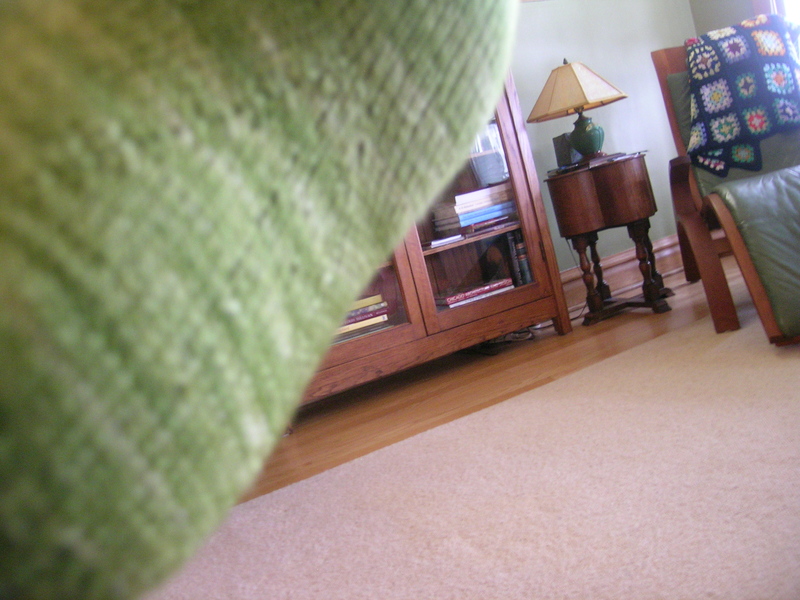 This is a continuous loop, knit in garter stitch, about 7′ around. 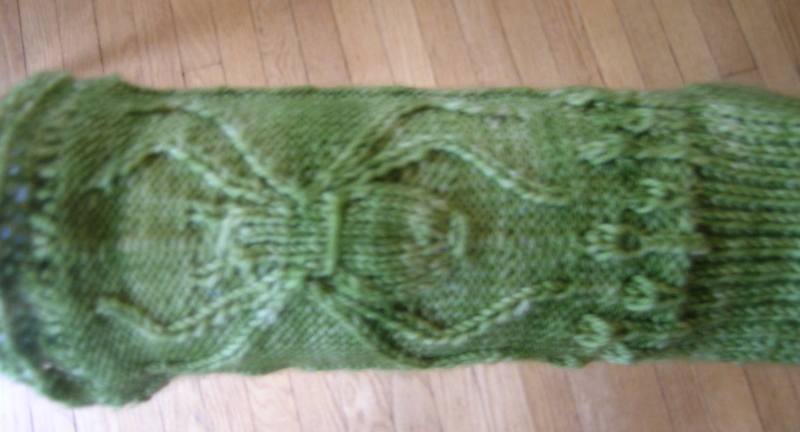 I started with a provisional cast-on, and then wove the beginning and end together with Kirchner stitch to make a large loop, knit with size 6 needles. It is very warm. Poor Ethan got no hand-made items this year. He is preparing to go to Japan for 6 months to work. I hear it is actually cold there, and you have to take your shoes off at every entrance. 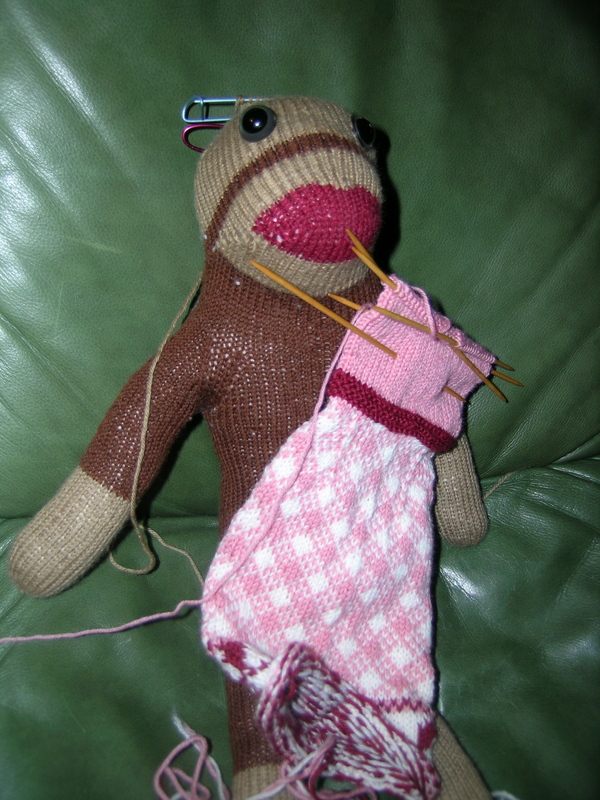 I think that I will make him a fine pair of knitted socks to take along. I am glad you & your family had a wonderful Christmas. 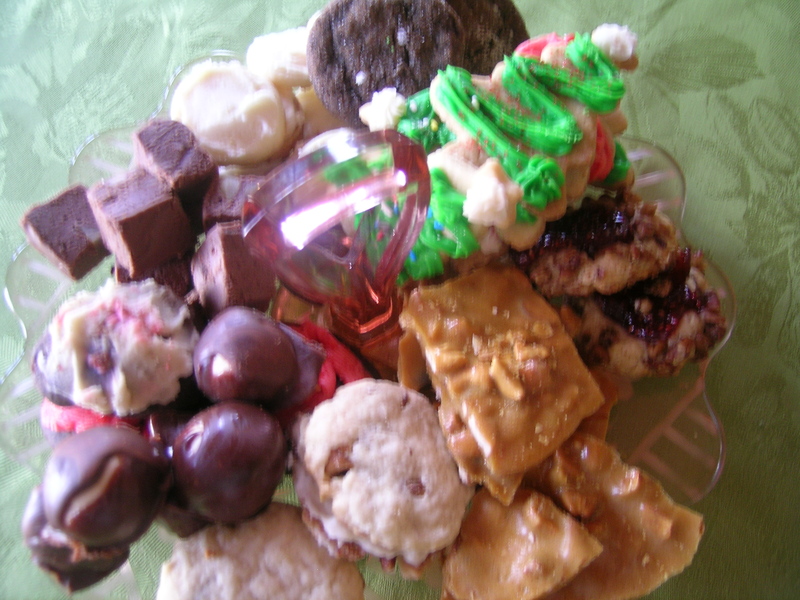 I love the cookies – it’s a great idea to make lots for Christmas presents. I have been making biscuits on a small scale, but it would be good to extend it. 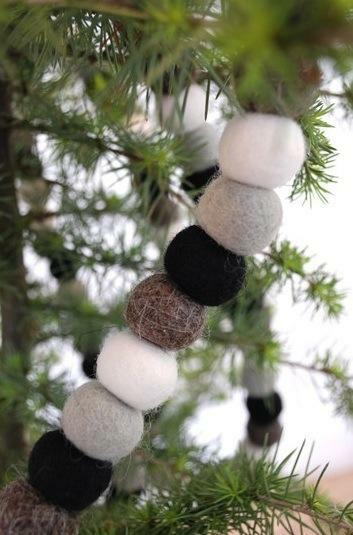 I like the idea that you can chose your own traditions and extend them year by year – yes, why not? I’ll make a tradition of biscuit making. 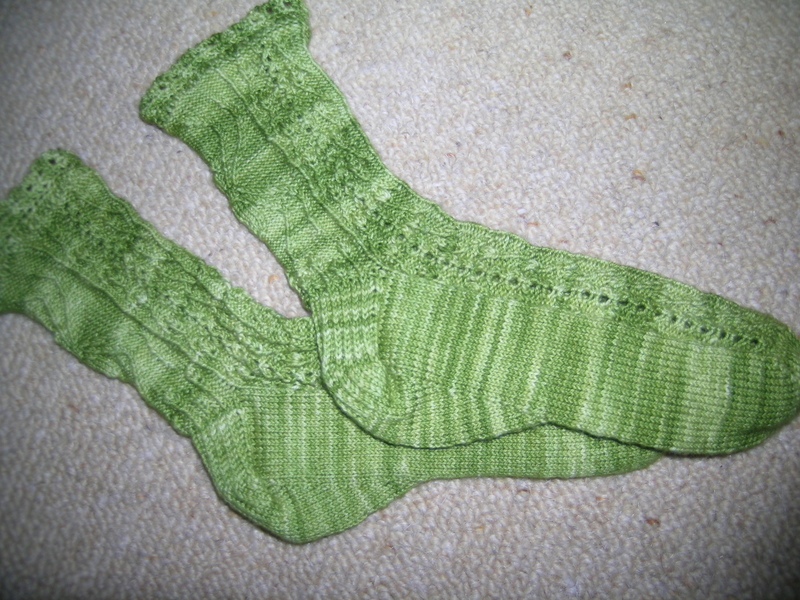 I finished these spider socks a couple of days ago. I am not sure if I am keeping them for myself, or giving them away. 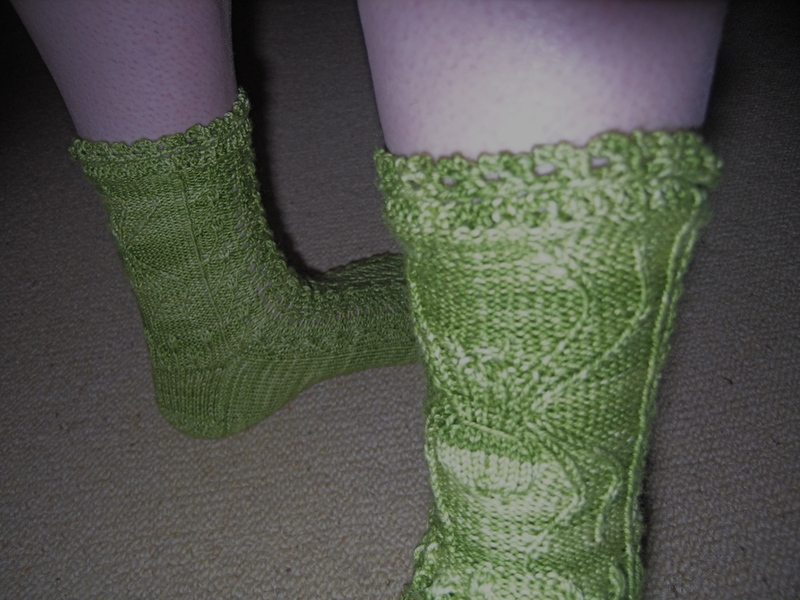 I made them with Malabrigo sock yarn, color Leaf. 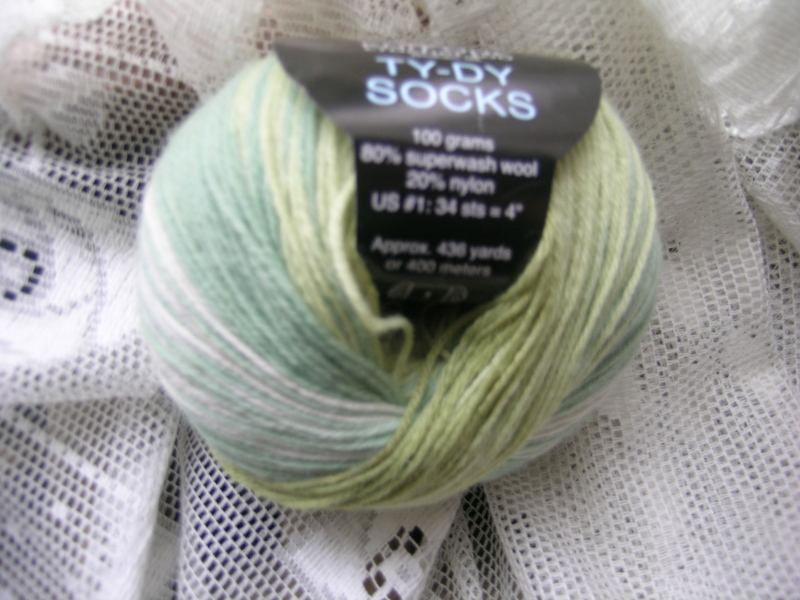 I really like this yarn, it has great colors, is the fine gauge that I love, and knits up beautifully. 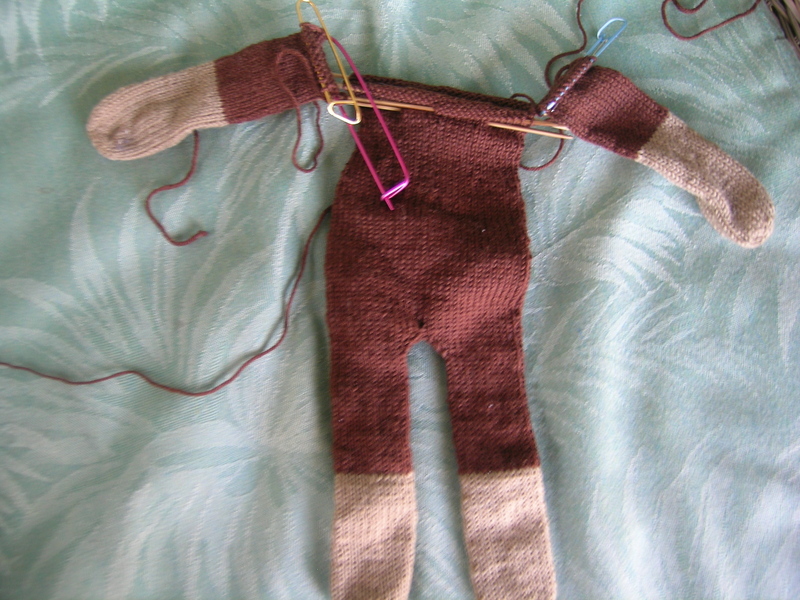 Yesterday I got no new knitting done. 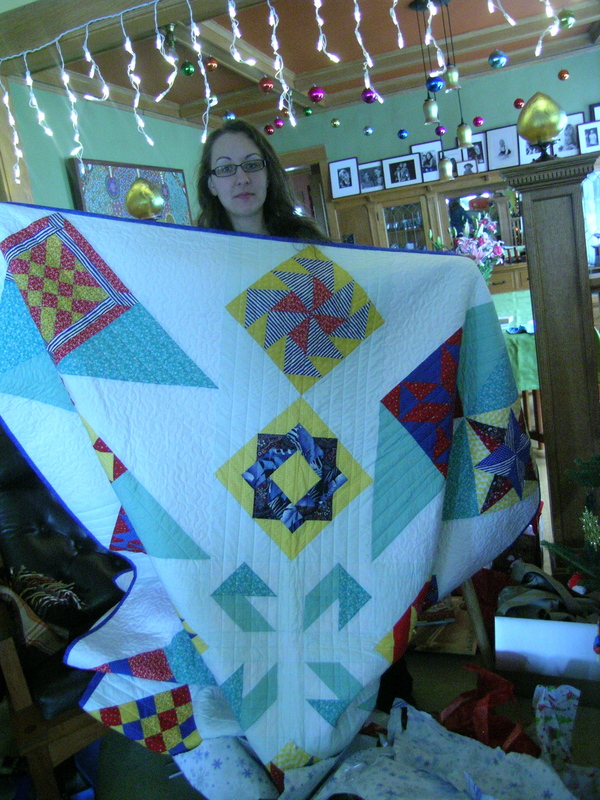 Working on finishing the binding on a quilt. We also received a new old cabinet for the Living Room, and move the LR bookcase to my husband’s office. So, today is putting tons of books back in place. When I bought the Jumbo flyer for my spinning wheel from someone on Ravelry, it came with the maiden head and an incorrect sized orifice. I had to go online and order a new plastic fitter to accept the jumbo flyer—all of $2.50, so no big deal except for the down time on the spinning. 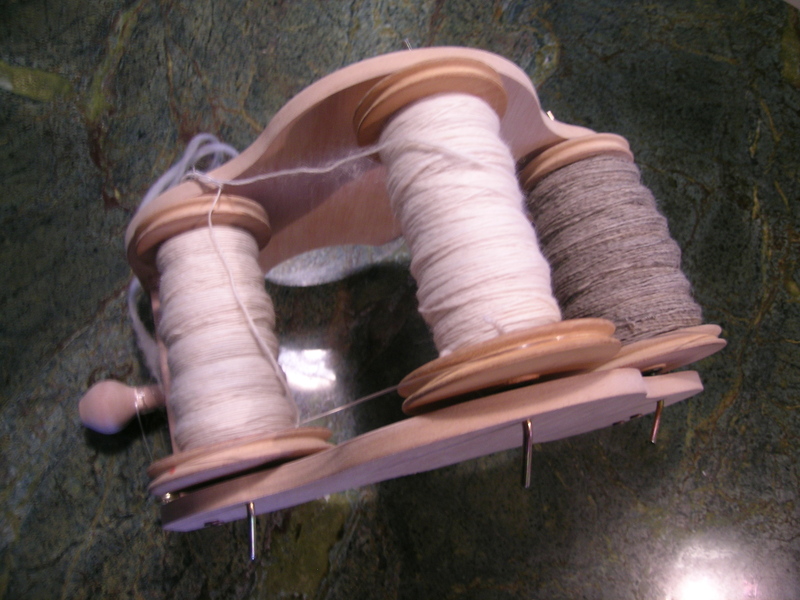 All of my bobbins were full as I thought I would be able to ply with the new jumbo bobbins. So, while I was ordering anyways, I decided to get a horizontal Lazy Kate. I did not like the few times that I had used the one that came with the spinning wheel. 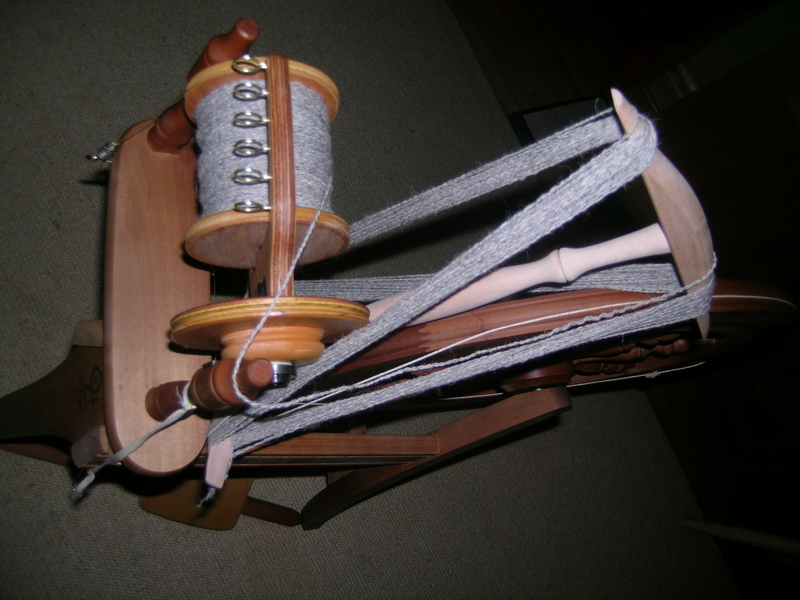 I got a tensioned Lazy Kate, to avoid the spin back, and keep the bobbins in sync better. 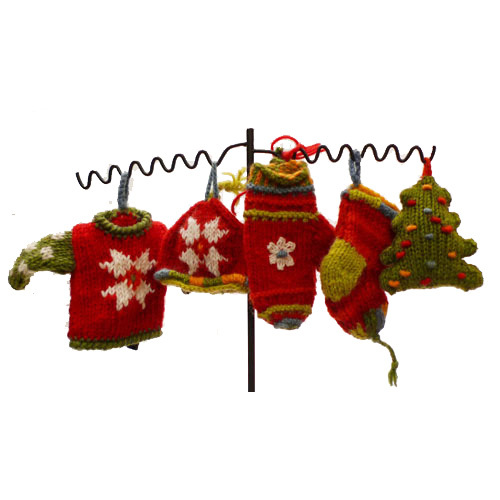 Garnstudio and Drops Design have a Christmas Calendar with a new FREE pattern every day from December 1st-24th. I will be watching for the patterns the rest of the month. 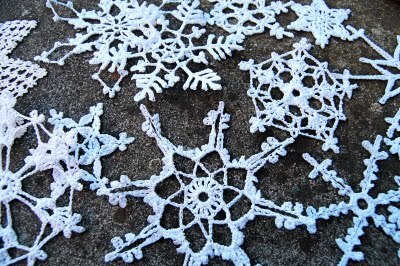 Thanks for pointing this out – some very attractive and Christmassy patterns so far. 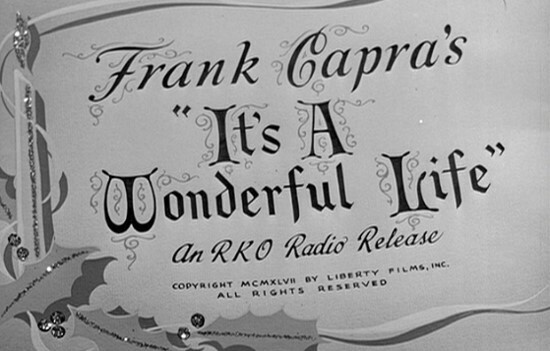 Not sure who is going to want to knit the Dec 24th pattern in time for Christmas Day, though…..
Our local community bank (yes a few do still exist), rented the local movie theater’s large screen yesterday and gave a free showing of It’s a Wonderful Life. This has to be my favorite movie. I first saw it in college, when they used to show old movies in the large auditoriums. Remember, this was pre-VCR. Then, when we did get a VCR, this was one of the few movies that I HAD to have. And last year, my kids upgraded me to a Blue-Ray player, with this movie of course. There are so many iconic images and quotes in this movie. A few years after meeting me, my husband also became a huge fan. He loves to quote from this movie throughout the year, it is amazing how many phrases can be made to be relevant to a current situation. His favorite is “I’ll wait for you Babe.” It is not the Christmas season without at least 2 viewings. 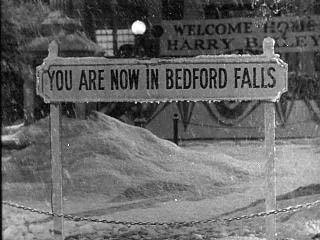 Many Christmas Eves I sat up into the wee hours wrapping presents with Bedford Falls to keep me company. 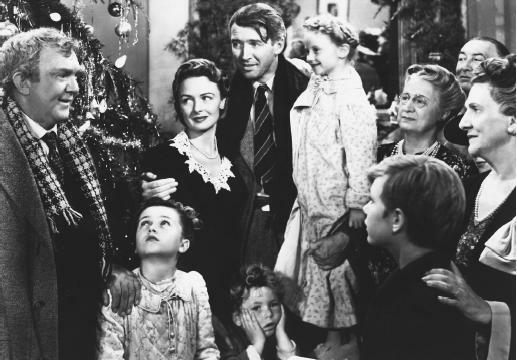 I was so excited when I moved to Oak Park, and have a friend named George Bailey who actually lives on Clarence Street, and another friend who is from Elmira, NY. 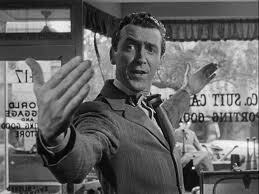 And sometimes, I do feel like Oak Park is a bit like Bedford Falls. I always get a good feeling when watching this, and it reminds me that life is not about stuff, but about the friends and family that you have to share life with. In that regard I am truly blessed. Thank you to all my friends and my family for always being there, supporting me in everything that I do, and sharing the ups and downs of life.